We were recently able to sit down with our plastic surgeon, Dr. Charles Perry, to discuss the tummy tuck consultation process. Below are Dr. Perry’s answers to questions regarding this popular body contouring procedure offered at our Sacramento plastic surgery practice. Q: What are some common concerns or reasons you have heard your patients give for pursuing this procedure? Dr. Perry: Most people desire a more fit appearance. While they can hide the loose skin with clothes, they are constantly self-consciousness of the excess skin and loose muscles. They also desire a more healthy appearance, a tighter core so to speak that allows them to feel like they did before kids; or because weight loss created a core looseness or weakness. Q:When a patient comes in for the initial consultation for tummy tuck surgery, what sort of questions do they generally have? Q: Who would you describe as the ideal candidate for a full tummy tuck? Dr. Perry: An ideal candidate for a full tummy tuck is someone who is healthy and vital. We often require patients to have a body mass index less than 35 and more than 15, ideally around 20. They will have a supportive friend or family member to care for them and support them through the transformation. Ideal candidates also have an anatomy suitable for a full tummy tuck. This means that there is loose skin above the umbilicus and below. They must be able to take a week or two for recovery, and have reasonable expectations for the healing process and expected results. Q:How do you proceed if the patient is not a good candidate? Dr. Perry: Candidates that will not do well with an abdominoplasty would have a BMI [body mass index] greater than 35 or less than 15. These numbers are associated with difficulty healing, as well as blood clots and infection. They would be smokers not able to quit for 4 weeks or without social support for the recovery period. If they do not have loose skin above the umbilicus, a mini tummy tuck may be more suitable; and if they only have excess fat and minimal excess skin, liposuction may be more appropriate to achieve their cosmetic goals. Someone is also not a good candidate if their goals are unachievable and/or their expectations of the recovery time frame are unrealistic. Q: What are the most common misconceptions you hear from your patients regarding tummy tuck surgery and what it can/cannot achieve? Dr. Perry: It is amazing how well informed patients are before they arrive for a consultation. Over the past ten years it seems that patients arrive at the consultation knowing what they want as far as the procedure and are well informed. The most common misconception is the rapidity of healing. It takes a full year before the incision fades and the abdominal curves are maximally improved. It is hard to wait that long. However, I think this perception that the results occur overnight or immediately following surgery comes from the slew of television shows where the before-and-after occurs in a span of thirty minutes. It is also seen in popular culture – the immediate gratification. However with surgery and all things of great value, it takes time for the body to heal. It is well worth the wait! 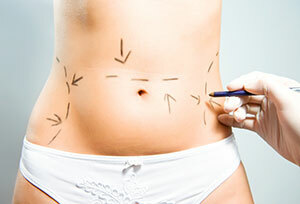 Q: What are other common topics/issues that you commonly cover in the tummy tuck consultation? Dr. Perry: Most people do not want to have drains following surgery. Recently we have been able to avoid using drains with progressive tension sutures. They have made the incisions look better and have eliminated drains. One of the other recent advances has been the use of Exparel. This has allowed us to eliminated pain pumps as it releases the pain medication in a time dependent way. Other topics are most often contours of other body areas to create more harmony. Other areas that are often covered are the buttock and breast. These areas often contribute to achieve the ideal hip to waist ratio and can be enhanced at the same time for appropriate candidates. Fat transfer to the buttocks along with liposuction can enhance ones’ contours. This is often combined with abdominoplasty. The thighs are another area that is addressed either with a lift or liposuction, as is the breast roll. The breast, or for men – the chest contour, is often addressed as well. A lift, liposuction, or breast implants may also be useful to enhance one’s figure. These topics often come up at the time of the consultation. Q: What is the ultimate goal of the consultation for tummy tuck at your practice? Dr. Perry: The ultimate goal of a consultation is to address the patient’s needs, whether it’s fact-finding, developing a relationship, discussing goals of the procedure, or timing. It is always our desire to meet the person and determine what it is they need and, to the best of our ability, give it to them in the most helpful way. I often see this process as educational and helpful to both our practice and the potential patient. When one leaves the office, our goal is for them to do so in a more informed and confident manner. If you would like more information on tummy tuck surgery, or if you would like to schedule a consultation with Dr. Perry to discuss your options, please contact us today.